The castor plant known scientifically as Ricinus Communis is a native of India and it is from the seeds of this unique plant that castor oil gets derived. Castor oil has been used medicinally for thousands of years in India before being adopted in Egypt, Greece and eventually Europe during the 17th century. When we think of castor oil, the majority of people know that it can be used as a natural constipation remedy but fewer people are aware of its wider uses including its antibacterial and anti-fungal potential, its many skin benefits and its beneficial effects on the immune system. 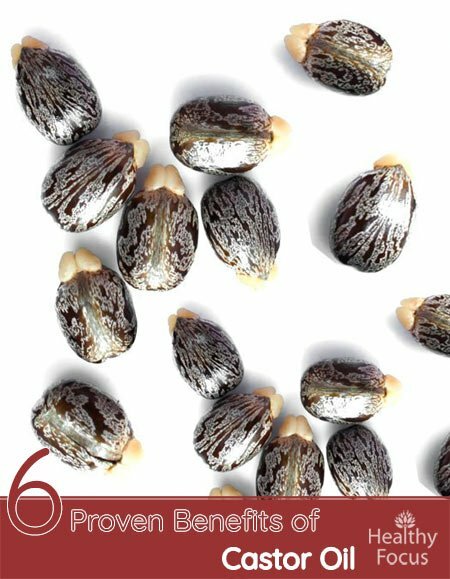 Castor oil is actually a triglyceride made up of various fatty acids of which 90% is a compound called ricinoleic acid –a unique fatty acid believed to be largely responsible for castor oil’s healing potential. Apart from the health benefits that we will be looking at in detail, castor oil has many practical uses and is often added to cosmetic products like soaps and shampoos as well as being used by the plastics, textile and rubber industry. You can apply castor oil topically to help moisturize your skin, treat burns and even help ease the symptoms of inflammatory skin conditions like eczema and acne. To Moisturize: Castor oil can easily penetrate deep into your skin which helps hydrate and soften it. It also helps boost the production of collagen which is important for healthier, stronger skin. People often use castor oil topically to reduce wrinkles and to tighten sagging skin. To moisturize your skin, mix some castor oil with another vegetable oil like olive oil or jojoba oil in a 1 to 3 ratio and gently massage it into your face each evening. You can also use castor oil to treat cracked heels by applying it to your heels before bedtime and covering your feet with socks overnight. For Dry Skin: Mix some castor oil with an equal amount of virgin coconut oil, apply it to any affected areas and let it sit for at least 20 minutes before rinsing it off. For Sunburn: Because of its excellent anti-inflammatory properties, you can use castor oil to soothe any areas of skin burned by the sun. Again combine your castor oil with an equal amount of coconut oil, apply it to your burns and you should experience fairly rapid improvement. For Acne: Because of its antibacterial and anti-inflammatory properties, castor oil is an effective natural remedy for mild to moderate cases of acne. Simply open your pores with warm water then massage a little castor oil into the affected areas of your face each night before bed. You can leave it work overnight before rinsing it of the next morning. For Scars and Stretch marks: Because of the ease with which castor oil absorbs into the skin, you can use it to help diminish the appearance of scars and stretch marks. There is no quick fix for scars but if you apply it to the affected area over time, it may help reduce their appearance. Applying castor oil topically to the body may help ease the pain associated with arthritis and gout and studies have found that castor oil taken orally is also an effective treatment for arthritis. One well known study published in 2009 was done to compare the effects of supplementary castor oil and diclofenac sodium on patients with arthritis of the knees. After 4 weeks the patients experienced significant improvements and the researchers concluded that castor oil could be used as a novel treatment for arthritis. (1) Castor oil may also be effective for other pains and aches like sciatica and back pain. The use of castor oil as a laxative is probably its best known traditional use. Castor oil is a stimulant laxative and is sometimes used to clean out the bowels prior to surgery. It works as a laxative by increasing movement within the intestines and effectively easing the passage of the stools. Unlike many over the counter laxatives, castor oil is considered safe but no less effective. Castor oil has galactagogue properties meaning that it helps stimulate milk production for new mothers. It potentially improves both the flow of milk and the volume produced but care should be taken and only low doses of cold compressed castor oil are recommended for lactating mothers. New mothers should not take castor oil unless under a doctor’s supervision in case it harms the baby. As with its many skin uses, castor oil can be used to treat a variety of hair problems from conditioning dry hair to actually boosting the growth of new and stronger hair. For Hair Growth: Massaging some warm castor oil into your scalp and hair can help your hair to grow by improving the flow of blood to your scalp and follicles. The fatty acids in castor oil can also help nourish the hair. Massage the oil into your hair and roots then cover with a cap and leave it on overnight. Alternatively you can combine it in an equal ratio with coconut oil for the same purpose. For Dandruff: Castor oil boasts excellent antibacterial and anti-fungal properties which are ideal for treating dandruff naturally. Simply massage it into your hair and scalp several times each week to treat the condition. To Shine and Condition: Castor oil is a cheap and effective alternative to far more pricey commercial conditioners. Add a few drops of castor oil to your regular conditioner and you will soon notice the difference. To get a great shiny look to your hair, warm your castor oil and massage it well all over your hair. Wrap your hair with a towel for at least an hour before washing it away. If you do this several times a week your hair will not only be stronger but it will look glossier and more beautiful. According to research castor oil can help support your immunity by boosting the lymphatic system. Lymphocytes are the immune system cells which help fight disease. When the lymphatic system is under-performing, toxins and waste accumulate resulting in various sicknesses. According to one study, castor oil applied topically with a castor oil pack is absorbed into the body via the skin and increases the lymphocyte count. This process helps remove toxins from the tissues and boosts healing. Internal doses of castor oil depend on the reasons for taking it as well as other factors like age and other medical conditions. You should read the directions carefully before taking it but it is recommended that you start slowly and take it for seven days at most unless you have been instructed otherwise by your doctor. A typical oral dose is between half a teaspoon and a whole teaspoon each day. More than a teaspoon each day may result in side effects such as nausea, vomiting, diarrhea and cramping. Castor oil is considered to be safe when taken in moderation nut be sure to consult a doctor if you are in any way concerned. Pregnant women and lactating mothers should not take castor oil unless it is recommended by a doctor. Despite its use for lactation and inducing labor, there is documented evidence that castor oil causes nausea and vomiting in these women. The same applies to people with inflammatory intestinal conditions, appendicitis and severe abdominal pain.